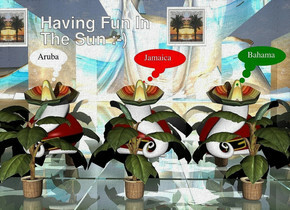 a tree.a 1st flat silver wall is 1 feet behind the tree.a 2nd flat silver wall is left of the tree.the 2nd wall is facing right.a 3rd flat silver wall is right of the tree.the 3rd wall is facing left.a man is behind the plant. the ground is shiny [beach]. a [pattern] sombrero is -1.9 feet above and -1.24 feet in front of the man. it leans 22 degrees to the front. a 1.3 feet wide and 1.7 feet tall flat [stamp] paper is -2.2 feet above and -8.9 feet right of and .1 inch in front of the 1st wall. It was strange ... that night before Christmas! a silver pen.a man is -8 feet right of the pen.the ground is snow.a deer is 3 feet right of the pen.a elf is 3 feet right of the deer.the elf is -10 inches in front of the deer.the elf is facing left.shiny ground.the sky is [christmas].the [christmas] is 200 feet tall. what happens when you do last minute shopping! a 1st cart.a man is behind the cart.a 1st cabbage is -24 inches above the cart.a 2nd cabbage is -6 inches right of the 1st cabbage.a lettuce is in front of the 2nd cabbage.a cauliflower is -3 inches in front of the 1st cabbage.a 1st bottle is behind the 2nd cabbage.a milk carton is left of the bottle.a 1st cake is -1 inches above the lettuce.a grapefruit is left of the milk carton.a box is -1.5 inches above the 1st cabbage.the box is leaning 25 degrees to the north.a can is -2 inches above the 2nd cabbage.a banana is in front of the can.a broccoli is -5 inches above the box.the broccoli is leaning 22 degrees to the north.a 2nd cake is left of the 1st cake.the 2nd cake is [christmas].the [christmas] is 6 inches tall.a 1st wave is in front of the cart.the 1st wave is snow.a 2nd wave is -2 feet right of the 1st wave.the 2nd wave is snow.the ground is snow.the 2nd wave is 2 inches in the ground.the sky is snow. 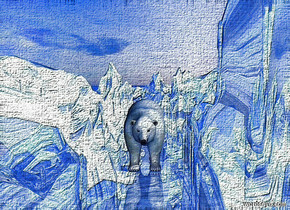 a shiny delft blue snow ground.ground is 10000 inch wide [melt].ground is 200 feet tall and 600 feet wide.ambient light is 60% dim delft blue.a 1200 inch tall polar bear is on the ground.the polar bear is facing north.a ink blue light is above the polar bear. 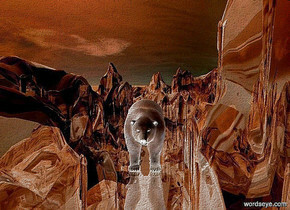 a shiny delft blue snow ground.ground is 10000 inch wide [cracked].ground is 200 feet tall and 600 feet wide.ambient light is 60% dim delft blue.a 1200 inch tall polar bear is on the ground.the polar bear is facing north.a ink blue light is above the polar bear. a 1st flat wall is 10 foot wide [nog]. camera light is black. ambient light is cream. a light is 10 feet above and 10 feet in front of the wall. a large flat bottle is -2 foot above and -6 feet to the right of and in front of the wall. it leans 130 degrees to the left. a 1st flat elf is -3 foot beneath and -1 foot to the left of the bottle. he leans to the left. 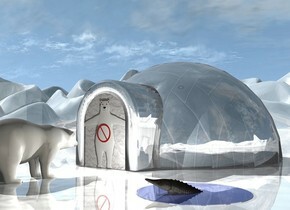 a 2nd flat wall is [nog]. it is behind and -7.5 feet above the 1st wall. Open just one present on Christmas Eve. a 3 foot tall teddy bear is -4 inch in front of a 3.5 foot tall bear. the teddy bear faces the bear. ground is [white]. a 100 foot tall and 10 foot wide fence is -28 feet in front of the teddy bear. it leans back. 6 delft blue lights are 1 feet in front of and -80 feet above the fence. it is night. a santa claus is 10.5 feet to the left of the teddy bear. he faces the bear. a christmas tree is 2 feet to the left of and in front of the teddy bear. 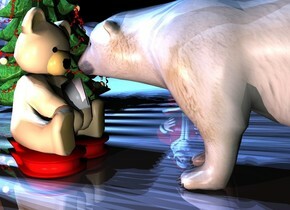 a pale baby blue light is 5 feet to the right of the bear. a pink light is 3 feet to the right of the teddy bear. camera light is dim. the [christmas] compass. The ground is white. it is 80 feet tall. 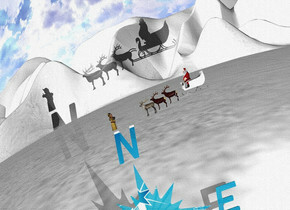 the first reindeer is above and -4 inches to the right of the compass. it is 1 inch tall. it is facing left. a second reindeer is -.2 inches to the right of the first reindeer. it is facing left. it is 1 inch tall. a third reindeer is -.3 inches to the right of the second reindeer. it is facing left. it is 1 inch tall. the sleigh is -.3 inches to the right of the third reindeer. it is facing left. it is 1 inch tall. the santa is .1 inches in the sleigh. he is 1 inch tall. he is facing left. a woman is above the compass. she is 1 inch tall. she is facing right. the very large silver cactus is 6 inches behind the compass. it is facing left. A reindeer is -1 foot left of Santa. It is 7.4 feet above the ground. It is leaning 90 degrees to the front. The ground is [snow]. 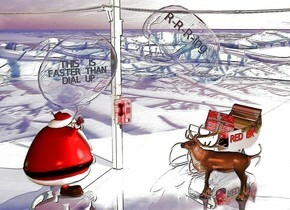 A 6 inch wide shiny red sphere is 7 inches above the Santa. It is 3.9 feet behind the Santa. Camera light is black. A scarlet light is in front of the sphere. The sun is black. 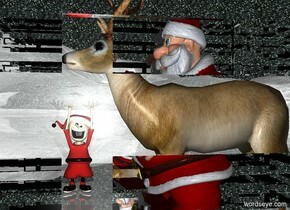 Santa is facing the reindeer. The elf is 3 feet behind the Santa. He is facing back. Another elf is -3 inches above the elf. 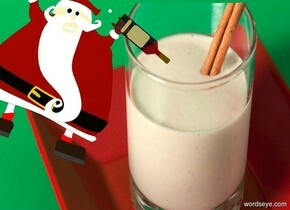 santa claus is behind a white table. a computer is on the table. it faces santa claus. the table faces back. a big house is -2.8 feet above the table. the house is 5 foot tall [christmas]. the house's floor is silver. a mouse is to the left of the computer. it faces back. a big christmas tree is behind and -3 feet to the left of santa claus. a big present is in front of the tree. a pink light is 5 feet above the table. A reindeer is -1 foot left of Santa. The ground is [snow]. 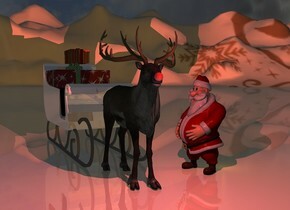 A 4 inch wide shiny red sphere is 1.9 foot in front of and -2.35 foot above and -2.75 foot left of the reindeer. Camera light is black. A scarlet light is in front of the sphere. The sun is black. 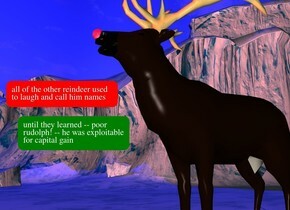 Santa is facing the reindeer. 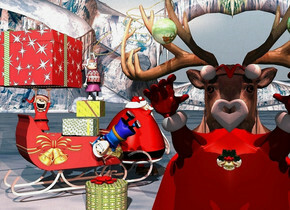 A 6 feet high shiny sleigh is behind the reindeer. A very large present is on the sleigh. A large present is on the present. A dim marmalade light is right of Santa. A dim maroon light is left of Santa. 1st santa faces left. a 7 inch thick silver wall is -2 feet in front of the santa. 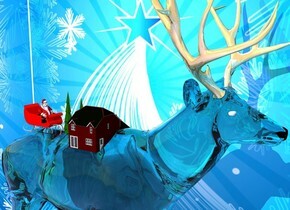 a reindeer is -5.4 feet above and -4.2 feet in front of and -7.5 feet left of the santa. it faces left. a [Christmas] sled is 3 feet in front of and 7.6 feet right of the santa. it faces northeast. 1st elf is -1.5 feet above and -2 feet in front of the sled. it faces the wall. 2nd santa is -3 feet right of and -9 feet in front of the sled. he faces northeast. 1st large gift is -1.2 feet above the sled. 2nd gift is .01 inch above and .3 feet right of the 1st gift. 3rd huge gift is -.01 inch above the elf. 2nd elf is -.01 feet above the 2nd gift. it faces northwest. the shirt of the 2nd elf is 2 inch tall [candy]. a 4 inch wide shiny forest green sphere is -17 inches above and -41 inches in front of and 18 inches left of the reindeer. 1st 6 inch tall and .3 inch wide clear tube is on the sphere. a tiny bell is -1.1 feet left of and -1.2 feet above and -1.54 feet in front of the 1st santa. it faces left. it leans right. a gold rope is -.5 feet above and -.9 feet right of and -1.6 feet behind the 2nd elf. it faces right. it leans 36 degrees to the southeast. 3rd elf is -2.6 feet above and -7.9 feet in front of and -6.2 feet right of the sled. it faces left. it leans 130 degrees to the left. 4th large gift is -4.8 feet above and -.6 feet left of the 3rd elf. a salmon light is 2.5 feet in front of and 3 feet above and -8.5 feet left of the wall. a coral light is -3 feet above and 8 inches in front of the wall. the camera light is 30% dim lilac. a orange light is -3 feet in front of and -1 feet above and 2 feet left of the 1st santa. 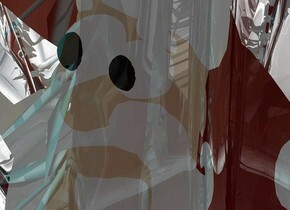 There is a light cyan clear deer. a [snow] wall is to the right of the deer. the wall is facing the deer. there is a 8 inch tall house 1.5 inches in the deer. the house is facing away from the wall. a first 9 inch tall pine tree is behind the house. a 2nd 10 inch tall pine tree is 2 inches behind the 1st pine tree. a 6 inch tall red sleigh is behind the 2nd pine tree. 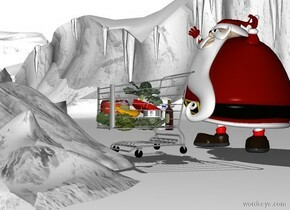 a 6 inch tall santa is 1 inch in the sleigh. a gold light is above the deer. the sun is light pink. the camera light is forget me not blue. a blue light is above the gold light. the antler of the deer is shiny. the eyeball of the deer is white. You left it behind ... you deliver it! 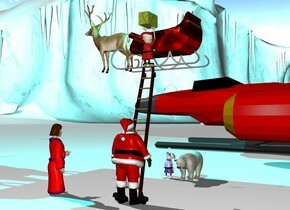 a ladder.a man is -14 inches in front of the ladder.the man is facing the ladder.a sleigh is above the ladder.the sleigh is facing left.the sleigh is behind the ladder.a elf is above the ladder.the elf is facing the sleigh.the elf is -36 inches in front of the ladder.a box is above the elf.the box is -12 inches right of the elf.the sleigh is [christmas].a deer is -16 inches left of the sleigh.the deer is facing left.the ground is snow.a cyan light is 1 feet above the sleigh.a polar bear is 5 feet behind the ladder.a 2nd elf is 6 inches left of the polar bear.a woman is 3 feet left of the man.the woman is facing the bear.the woman's bathrobe is red.a spaceship is 10 feet behind the bear. 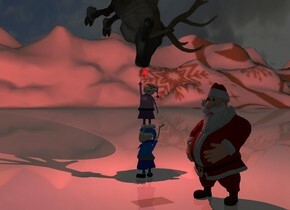 Santa is lost in the ice cave! a clear cactus.the cactus's thorn is snow.the ground is snow.a 1.5 feet tall man is -2 feet above the cactus.a white light is in front of the man.the camera light is aqua.a linen light is above the man. ground is white. a snowman.sky is midnight blue. it is noon. 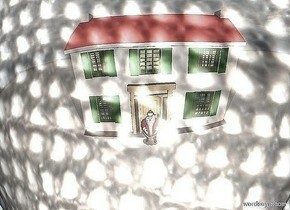 a ghost white light is 10 feet in front of the snowman. a white dog is -.8 foot to the right of the snowman. a shiny house is 5 feet behind the snowman. the house is white. 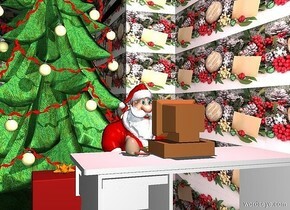 a santa claus is 10 feet in front of and -1 feet to the left of the house. the santa claus faces back. a gigantic shiny armadillo leans 90 degrees to the back. a house is 20 feet to the left of the armadillo. the house is white. the house's roof is red. the house's window is green. the house's gutter is white. it faces the armadillo. it is noon. a person is to the right of the house. he faces the armadillo. sun is azure.